Problems involving our furry friends’ eyes can progress quickly, and eye pain is one of the more unnoticed conditions. 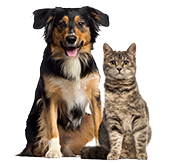 It can be so severe that, for the sake of your pet’s quality of life, you’ll want to get it treated as soon as possible. Eye conditions in dogs include cataracts, cherry eye, coloboma, corneal ulcers, glaucoma, progressive retinal atrophy, and dry eye. Noticeable vision problems include blindness (running into things, not being able to see toys), redness (specifically “cherry eye”), squinting and acting uncomfortable in bright lights, and bumps or foreign matter on the eye. Not as easy to pinpoint, keratoconjunctivitis sicca (aka dry eye) in dogs leads to excessive blinking, swollen blood vessels or eyelids, and discharge. Corneal ulcers are surface erosions within the eye. Ulcers not only occur from trauma, but can also develop from hair or eyelashes scratching the eye, poor tear production, and high intra-ocular pressure. Signs and symptoms include visible surface damage, or your pup holding the eye partially closed from pain. Many ulcers are not visible and will require fluorescent staining (also known as fluorescein eye stain) to be identified. Tears lubricate the cornea and help to remove debris. KCS, however, impairs the amount of tear production, making eyes more prone to ulcers andocular damage. Cocker spaniels, Boston Terriers, and Shih-Tzus are commonly affected by this condition. Signs often include painful, reddened eyes, corneal ulceration, and excessive blinking or squinting. You may also see a discharge due to the lack of tears. Primary KCS can be diagnosed with a tear test strip. Significant improvements have been in the treatment of dry eye. Instead of treating the symptoms with daily eyedrops for your dog or cat, surgical options how exist to correct underlying issues for a permanent solution. 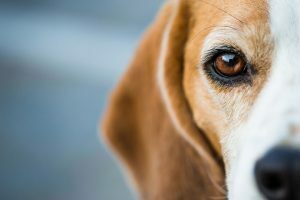 Glaucoma is often a serious and challenging disease; about 40% of dogs will become blind in the affected eye within 1 year, and 50% are prone to developing the condition in the opposite eye. This is why intraocular pressure testing regularly with your vet is crucial! Glaucoma is due to inappropriate fluid drainage, so pet parents usually don’t notice it until it’s become serious. When it is noticeable, a pup’s eye is painful, reddened, cloudy, or showing vision loss. 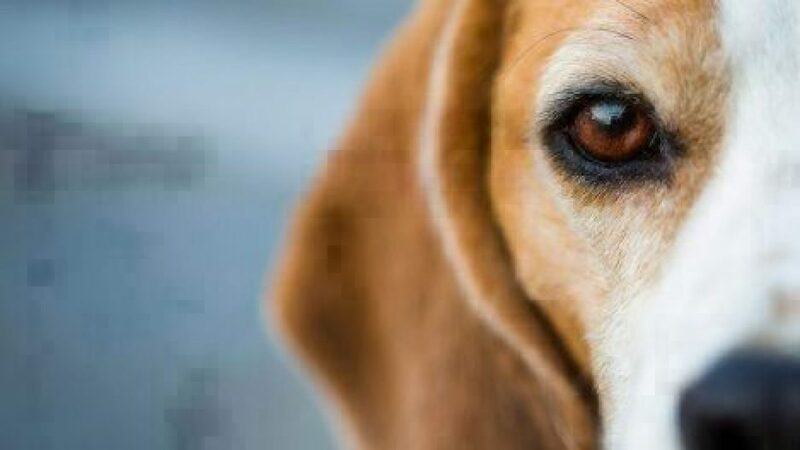 To learn more about Glaucoma in dogs, read about Buddy Lee, in Happy Tails with Buddy, a Basset Hound’s story from glaucoma diagnosis to recovery. Cherry eye is prolapse of the third eyelid, which appears as a swollen mass near the lower eyelid closest to the nose. Treatment often involves surgery. If you suspect this in your pup, do not delay assessment by a veterinarian, as permanent damage to the tear gland can occur, which will lead to further eye problems for your dog! Entropion and Ectropion are inward and outward rolling of eyelids in relation to the eye respectively. Entropion often causes abrasions to eye surface and typically requires surgery. Ectropion is well tolerated in many cases yet may need surgery in more complex cases. Saint Bernards with droopy lower eyelids are a good example of ectropion. What should you do if you suspect eye complications in your pet? Know your pet’s eyes: take a good look at your pup’s eyes often, especially if their eyes are hiding behind hair! Also, have your vet take a peek at their eye health during regular visits. On that note, keep hair trimmed! Long strands can hide problems, or even be the cause of them. Note any discharge that occurs and clean tearing or buildup with water regularly. If your pup has difficulty seeing, vision-proof your home at a dog’s level to prevent unexpected run-ins with sharp objects. “Can I treat or clean my pet’s eyes prior to seeing the vet?” Refrain from applying ointments or contact solutions to eyes as these can be damaging. Always consider any obvious eye pain (squinting/holding eye shut) to be an emergency. Over 2016, Healthy Paws found that eye condition claims were the fourth most common problem seen at vet visits, and that they can range from $50 all the way to $5,000 for specialty surgeries and treatments. Luckily, many of these conditions are easily treatable if diagnosed early. Communicate well with your vet about concerns and follow through with recommendations to keep your pup’s eyes in good health! Not all eye conditions can be prevented as they can be gestational or hereditary, but overall good health can keep dogs’ eyes in working order longer. Also, keep the eyes clean! Kristonn Colborn, DVM, is a small animal and equine veterinarian in Bend, Oregon focusing in primary and emergency care. She graduated from the University of Florida with doctor of veterinary medicine degree.